Salvation Army Territorial Headquarters, located at 120-130 West 14th St., Manhattan. Image credit: Beyond My Ken. Art Deco building from 1929, notable for its three-story arched entryway and asymmetrical massing. 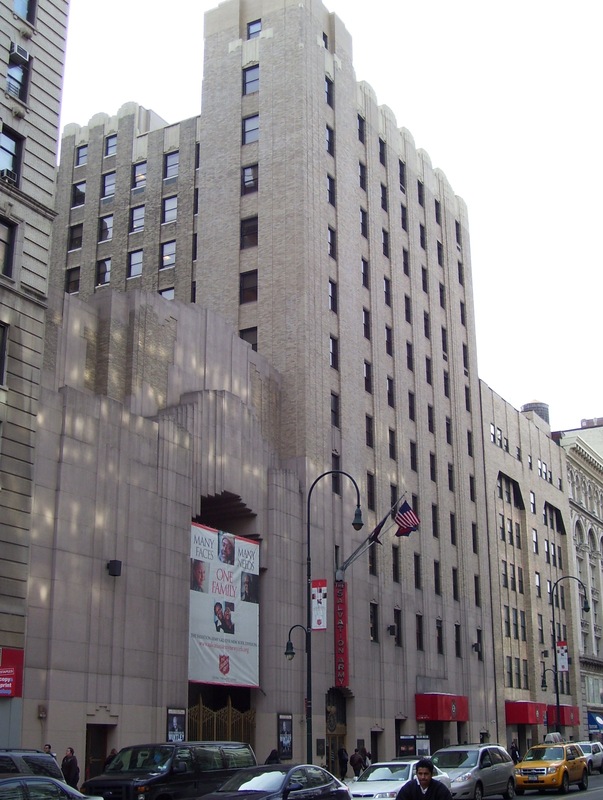 On February 11, 2014, the Landmarks Preservation Commission held a hearing on the possible designation of the Salvation Army Territorial Headquarters, located at 120-130 West 14th Street in Manhattan. The three-building complex, designed by Ralph Walker of Voorhees, Gmelin and Walker, was completed in 1935. Walker was the architect of the Western Union Building and the Barclay-Vesey Building, both individual City landmarks. The asymmetric Art Deco complex is clad in buff brick with cast-stone trim, and contains an auditorium, office space, and dormitory. The building is notable for its three-story arched entryway, and its vertical office tower. The Salvation Army’s Secretary for Business Major Sue Foley said the organization strove to take good care of the building, but would prefer that it not be landmarked. Foley said the building functioned as an important center of operation, and the church was concerned that landmark status would distract from its mission. Graham Hepburn, Director of Property Services for the Salvation Army, expressed concern that designation involve a diversion of “necessary funds” that would otherwise go to its evangelical and charitable operations. Architect for the Salvation Army Charles Edelstein testified that the building already exceeded the amount of floor area allowed under the site’s zoning and possesses no further development potential. Edelstein added that the structure possessed many non-historic elements, including a flagpole, signage, and a marquee, and needed to be maintained cost-effectively. The Historic Districts Council‘s Nadezhda Williams spoke in support of designation, identifying Ralph Walker as a significant and underappreciated architect of the interwar period. Williams called the building “one of 14th Street’s most impressive structures.” Landmarks Chair Robert B. Tierney stated that the Greenwich Village Society for Historic Preservation had also submitted a letter advocating for the site’s designation. Chair Tierney closed the hearing after thanking those who testified. No date has been set for a vote on designation. LPC: Salvation Army Territorial Headquarters, 120 West 14th Street, Manhattan (LP-2565) (Feb. 11, 2014).